2011 is coming to an end... miraculously I survived each growing pain; it has been a year crammed full of changes, complete with scary, stressful, and emotional moments, "if only's", "I don't want to's", and "I wishes". Looking back at everything, 2011 was all about Growth... lots and lots of growth! ...It has been a doozy of a year. Christmas came and went. 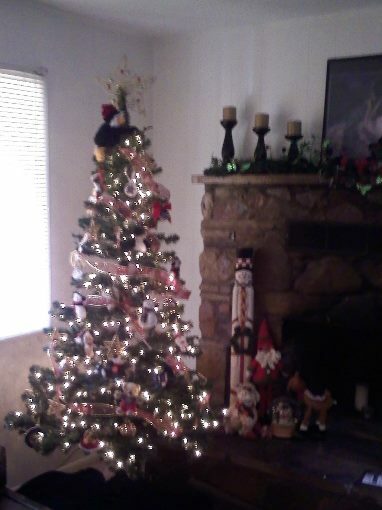 I wanted it to be special this year because this Christmas marked the end of a tradition in our old family home; it was the last Christmas in that house. Unfortunately I had been fighting a migraine for 3 days and was feeling tired and depressed. I swear I have a block when it comes to holidays. I start off with all the intentions of having a good holiday, but something always manages to drag me down and I haven't learned to not "permit" it from happening. I wish I could be like my sister and put on a happy face and fake it. I did make it over first thing in the morning to watch the little ones open their gifts; they are so cute! I will post pics later... haven't uploaded them to my puter just yet. No gifts for the adults this year... due to the financial hardships, we decided to just focus on the little ones. The girls got lots of Barbies, including Monster High dolls. Kaden got noisy little boy toys LOL and all three kids got plenty of clothes. They were very happy with everything. Afterwards I headed home and went back to bed for a few hours before I had to start cooking. We did a potluck dinner this year... I was assigned the Green Bean Casserole. I arrived with my dish still hot and right on schedule. Dinner was served buffet style, and being as there was no dining room table, the adults ate in the living room and the kids ate at their little table. Several of our traditional items were missing this year. No chocolate pie, no fruit salad, no yams, no pumpkin pie. My 19 year old had to work and he was greatly missed. The whole experience was... well it was just off; it didn't feel right. When I got home later, I just wanted to cry, then I went back to bed. Welcome Yule Blog Party Peeps! Yule is here! Time to count blessings, and take a few minutes to enjoy the beauty of this Season... that's my favorite thing to do during Yule, just take time to sit and enjoy, maybe curl up with a hot cup of cocoa and reflect upon this Winter Solstice and the changes all around us. Beloved Mother Goddess and God, walk through our homes, and take away all worries and illness; please watch over and heal our families and friends. Bring peace where there is chaos, bring light where there is darkness and put love in our hearts. Let us rejoice in the beauty and magick of the Season, as well as our many blessings, and help us to spread love and joy wherever we can ♥ Blessed be! In a medium saucepan mix the chocolate and heavy whipping cream over medium heat, and sir until all the chips are melted. Add the Half and Half, milk, vanilla, and peppermint. Stir to mix well and until the desired temperature is reached. Pour into cups, top with whipped cream and garnish with a candy cane. Enjoy! My morning ritual started as my norm... hitting the snooze button several times before reluctantly climbing out of bed, grabbing my robe and towel, stumbling around the cats to the bathroom and taking a shower. After drying off and wrapping my hair, I reached for my robe and put it on my still damp body; I already had one arm in a sleeve and was putting the other arm in when I noticed a wolf spider inside my robe. Stifling screams I frantically danced around trying to pry my clinging robe off my damp body, spinning around in circles, yanking at my robe and making little squeals, trying not to wake up my son LOL the damned thing finally fell on to the floor before I managed to rip that robe off of me. Needless to say, I killed that sucker, then promptly shook the hell out of my robe and reluctantly put it back on for my trip back to my bedroom. Snow greeted me again this morning; it snowed off and on all day yesterday, through the night and off and on again this morning! I'm am currently sitting at my desk at work cuddling with my heating pad LOL! The roads were actually clear this morning though whereas yesterday morning I slid through the intersection at work as well as every corner on the Res on the way to the office! Thankfully I managed to stay on the road... sheesh! It's beautiful but the roads are slick as hell! Even in 4 Wheel Drive I slid around corners coming to work! Needless to say, some of our personnel didn't make it in... too bad our Boss won't give us a paid snow day LOL I would love to be home cuddling with my electric blanket right now! While I was at Wal-mart I broke down and spent $75+ on an electric blanket. We live in a little house built in 1965 with no vents. Yes, we have a heater in the main living space but no vents to the other rooms, and due to (1) I need to keep the cats out of my bedroom (2) my weird security/privacy issue (I have to have my door closed) and (3) the fact that I have 2 single pane windows in my room.... well, my bedroom gets damned cold! Up until now I was cuddling with my heating pad to stay warm, but now I have an electric blanket, and boy what a difference! I have always said I would rather be too cold than too hot, but this is ridiculous! Although I am no longer freezing, I end up roasting when one of my heat flashes kick in and kicking off all the blankets until I'm finished sweating like a pig (sigh) ... Ahhh the joys of menopause. Mom was back in the hospital early Thursday morning but back home by Saturday morning. She's pretty much back to normal. On Friday I went to my Doc and had him take a looks-y at me knee, and ended up getting a Lidocaine and Cortisone cocktail... yep you guessed it, in my knee. He had to jab me twice, but seriously... it was not as painful as I was expecting; I was anticipating some serious pain but thankfully I was wrong. Unfortunately, it doesn't appear to have helped. He said if it doesn't help, to call his office and he will start the process for an MRI, so that's my next step. With Christmas/Yule fast approaching we are trying to figure out dinner plans; it looks like we will gather at the big house with each household bringing a dish; we are suppose to have a meeting and decide who is doing what. This will be our last Christmas in that house, and possibly our last Christmas dinner as a family (with Mom and Deb) only time will tell. I'm considering making homemade peanut brittle this year... CONSIDERING is the key word LOL I am not one of those people that actually enjoys cooking/baking; I wish I was! Microwave first 3 ingredients in a 2-quart glass bowl on HIGH 5 minutes, using an 1100-watt microwave oven. (Microwave 1 more minute if using a 700-watt microwave.) Stir in peanuts. Microwave 3 more minutes in an 1100-watt oven (add 1 more minute in 700-watt oven). Stir in butter and vanilla. Microwave 45 seconds in an 1100-watt oven (add 1 more minute in 700-watt oven) or until candy is the color of peanut butter. Stir in baking soda (mixture will bubble). Working quickly, spread hot candy in a thin layer onto a lightly greased baking sheet using two metal forks. Cool completely. Break candy into pieces. Is this not a gorgeous stone? Look at the sparkles and patterns! 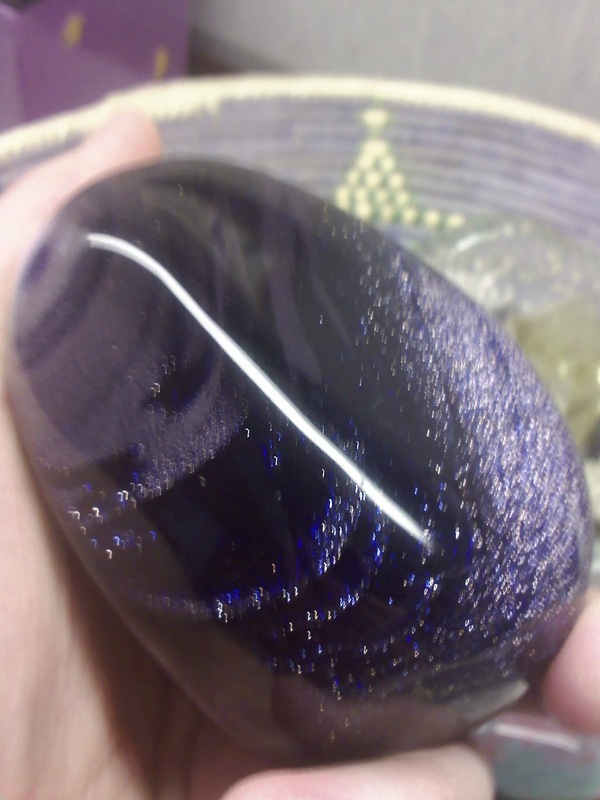 It's man made in a lab, the purple variation of goldstone, but isn't it beautiful? I love the deep purple color! I found this particular stone at my favorite store in the Arizona Mills Mall a few years ago... Black Market Minerals. I can spend hours in that store! HISTORY: Goldstone has been around since the Rennaisance period when early Monks were working in a glass factory, practicing alchemy via a fortunate happenstance, some molten copper was tipped into a container of molten glass which crystallized into thousands of tiny crystals forming a gorgeous melt with sparkles in it, and "monkstone aka goldstone" was born. Yes, sometimes accidents are wonderous things! HEALING PROPERTIES: Purple Goldstone aka Purple Sandstone, being a crystalline entity containing copper and manganese is considered a healing stone; it is beneficial in increasing blood flow, reducing inflammation, as well as stabilizing emotions, and encouraging one to remain calm. Because of its copper content it is also an energy generator, and protects against negative energy. 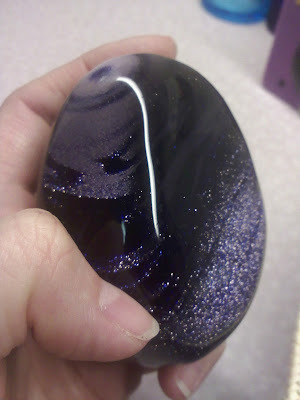 Purple Goldstone is associated with the Heart, Throat, and Third Eye Chakras; it aids in opening psychic awareness. We are a very close knit family, in fact most of my adult years were spent living right next door to my parents, until last April when Mom announced she was taking the big step of putting the house on the market; I found myself a little rental house for my son and I, and moved out with mixed emotions... glad to have a place of my very own, yet dreading the loss of our family home. Mom and my Sis are currently still living there BUT finally making the move to Phoenix where Mom will be closer to the medical care she needs as well as a lower elevation to ease her breathing, and where Deb begins her new job. Yesterday they found an apartment in the Valley and where Deb is excited, Mom is panicking, and I am having torn feelings. I know in my gut and heart that Mom will be better off down there; it's the best thing for her health, and Deb will be happier but... I'm gonna miss my Mom!!! As soon as Deb texted me and told me they found a place, the tear works began. I have a feeling that I won't see her again... whether that's just fear or intuition, I don't know. You see, Mom has been in bad health since Dad passed away in 2006; she has almost crossed over many times, been intubated approximately 9 times now, and scaring the bejeezus out of me each time; she may join Dad any day, and being as my vehicle is not travel worthy, I cannot travel down there to visit, nor be there should she have another episode of CHF... I'll be stranded here in town, and the thought of that upsets me, to say the least. I WANT TO BE THERE IF SOMETHING HAPPENS, and I want to be able to just visit, and Mom.... Mom wants her family around her; she's always wanted her family around her, but even more so since Dad passed over. This is hard for both of us... while Deb is on the opposite spectrum, jumping for joy. Last night I began Positive Affirmations; and will continue them nightly, and through out the day as needed. I always fall back to my affirmations, what else can I do; this is a fact of life and I knew it was coming, but being forewarned and aware is different from experiencing it. You think you can be strong when the time comes, but then when it does you fall to pieces, you know? Yeah, that's me. I just hope I can hold it together on moving day... at least for my Mom's sake. After they are all loaded up and driving towards the highway, the hysterics can begin. Please Goddess, let me stay strong until AFTER they are headed out of town! Moving day is mid-January, so I have a few weeks to get my emotions under control.... but then there is Christmas right smack in the middle... Please Goddess please don't let me be a blubbering idiot at Christmas! My Mom was raised that family is EVERYTHING, that we stay tight no matter what and she passed that down to her daughters. In fact we were talking about that just the other day and she said to me: "I wonder if we're wrong; I wonder if that's our problem; maybe the other people... the ones that are distant and detached are better off than we are?" Yeah, makes me wonder if the way we were raised instills codependency? Well, isn't that the sh*ts. Pagan Readers Challenge for 2012... YAY! I have decided to join the Pagan Readers Challenge for 2012. I L O V E to read, so this could be fun; however I am mostly a fiction reader and lose interest in non-fiction fairly quickly... BUT the good thing is, the rules say I don't have to read cover to cover, I can just read parts as long as I do LOOK at all the pages... and I am permitted to reread books, and I own LOTS of non-fiction pagan and spiritual books. I have posted on the side bar as well... where I will log my books as I go. I may or may not blog as I read... depends on my mood. Oh but wait! The rules also say I can include fictional books with a distinct pagan flavor... YAY! This challenge will begin January 1, 2012 and end December 31, 2012. Books read between now and January 1, 2012 will not count. Books that can be counted will include nonfiction books that are about spirituality, magick, the occult, nature, myths, or the paranormal. They can be reference, how to, informative, encyclopedias, or memoir. Fictional books that can be counted are anything that has to do with the paranormal, magick, witchcraft, or have a distinctly pagan flavor to the story such as The Divine Sisters of the Ya-Ya Sisterhood by Rebecca Wells. You may include books of any format including traditional books, ebooks, or audiobooks. Reference books are not usually read cover to cover so I will bend the rules here. You do not have to read the book from cover to cover, but you do have to look at EVERY page in the book. Choose a level. Levels may be changed throughout the year. Books on magick, the occult, and spirituality are not just meant to be read. Blog, tweet, or post statuses about the things you try from the books that you have read. Read a book or two that are outside of your tradition. Way out if you dare. For example, if you are Gardnerian Wiccan read a book on shamanism or High Magick. Read what the Bible has to say about magick and witchcraft or read books that speak against witchcraft and the occult. I double dog dare you.